A fun way to cut loose and tap into your inner James Bond (or Bond girl!) is planning a group night out at the casino. The Horseshoe Casino in Baltimore has everything you’d come to expect from a Las Vegas casino, but right in Charm City. 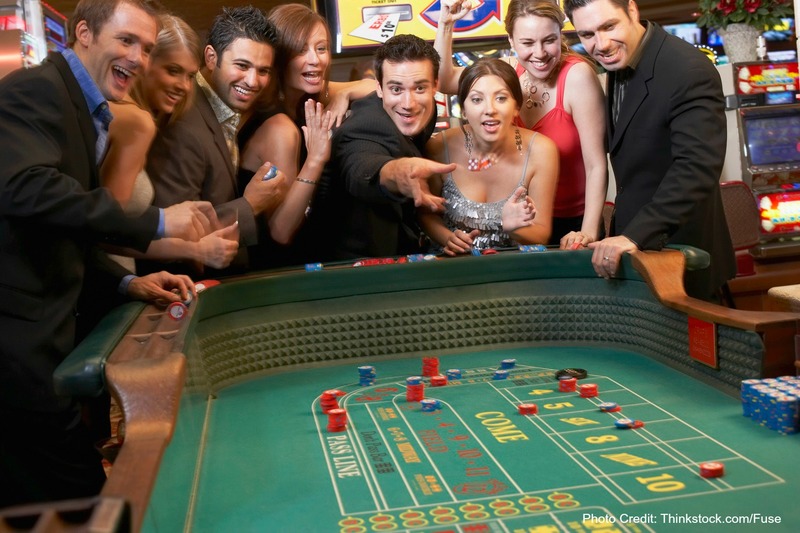 Bachelor parties, girls nights out–if you want to get gussied up, enjoy a delicious meal and try your luck at hitting it big, the Horseshoe Casino could be the place for your night out in Baltimore. As the high-end dining option at Horeshoe Casino, Jack Binion’s Steak offers U.S.D.A. Prime Aged steaks, excellent seafood and decadent desserts. If you’re going for that high-roller feel, a dinner at Jack Binion’s can get the night started off right. Jack Binion’s offers some fun themed events, too, like Bubbles and Bites (on Feb. 24). A prix fixe admission includes 6 course and 6 pairings while listening to a guest speaker. Tournament registration lasts from 3 to 5pm and tournament play runs from 4-7pm. With the final round coming in at 7:15pm, you can count on some well-timed, fun tournament play while leaving room for more fun through the rest of the night, whether at the Horseshoe Casino or not. Maryland’s premier poker facility comes to life at Horseshoe, the place synonymous with the World Series of Poker’s rich history. The WSOP Poker Room at Horseshoe Casino’s 25 tables offers loads of high-caliber, live poker action. With 153 table games and an exclusive high-limit gaming area, you’ll find the table for you, whether you’re in it for fun or in it to win it. Here’s a list of the table games offered…. BIG SIX: In this game, place your wager, watch the dealer spin the wheel and root for a win. ULTIMATE TEXAS HOLD’EM: Ultimate Texas Hold’em keeps the excitement going throughout the hand. THREE CARD POKER: Three Card Poker is the most popular poker derivative, probably because it’s so fun and easy to learn. With two betting methods, players can bet one method or the other, or even both, creating three ways to play. MISSISSIPPI STUD POKER: This is a riskier stud poker version because players must beat the dealer as well as other players, but the rewards can be big, in this fun and fast-paced game. FOUR CARD POKER: Four Card Poker is a relatively new casino card game that combines the appeal of Four Card Ante and Aces Up. FORTUNE PAI GOW POKER: Fortune Pai Gow Poker combines the ancient Chinese game of Pai Gow tiles with classic American poker and adds an optimal bonus bet. ROULETTE: Simple and fun, roulette is offered in every major casino worldwide and could perhaps be the most popular table game on earth. CRAPS: Boxcars. Center Field. Betting the Darkside. Craps is a game so unique it has a language all its own. BLACKJACK: The fast-paced game of 21 is the most popular casino table game in the United States. With a couple of side-bet options at the Horseshoe Casino, you can up your possible winnings. Don’t worry if all this sounds overwhelming. There are guides to all the table games on the Horseshoe Casino website you can read through before diving in. Book your stay at The Wayside Inn in historic Ellicott City and have easy access to all the fun of Baltimore with the charm of B&B accommodations!